← Happy Holi! Kind of like Christmas, but not. Religious Detox: Can I do it? We arrived in Pushkar today. After three hours tearing down an Indian tollway. Only in India would you share a six-lane freeway with trucks that have more coloured lights and garish hues than Eurovision (never heard of Eurovision? Google it! ), over-crowded minivans, bicycles, rickshaws, camel carts and cows. Cows have right of way, by the way. So Pushkar is one of the most religious towns to Hindus. Mahatma Gandhi’s ashes were spread over the lake that the town surrounds. All around the lake are temples with steps leading into the water, called Ghats. At these Ghats the religious pilgrims wash away their sins. I was tempted to do a quick purge of my many sins, but the murky green colour of the water, the giant black eels visible swimming at the surface, and many large turtles put me off. I couldn’t do it to Gandhi anyway. Due to the religious nature of this desert town, there is a No meat, No alcohol, and No smoking policy. It’s a Hindi boot camp! I know, you think I can’t do it. You know, I’m not sure I can either. One out of the three is a no brainer. Don’t worry Mum, I’m referring to the No smoking part. This is one town where chickens don’t live in fear of becoming spicy Tandoori chicken, succulent Tikka Masala, steaming chicken biryani or wonderful wonderful butter chicken. See how hard this is going to be? To top it off, we still have three bottles of duty free booze with us. No gin & tonics at sunset, no Canadian Club & dry after dinner. What sort of a religion is this anyway. I’m on holiday for Ganesh sake! Out of respect, we can’t even wear footwear around the lake. You should see what lives, crawls and is thrown on the streets here. I think a bout of tinea will be the least of my problems. 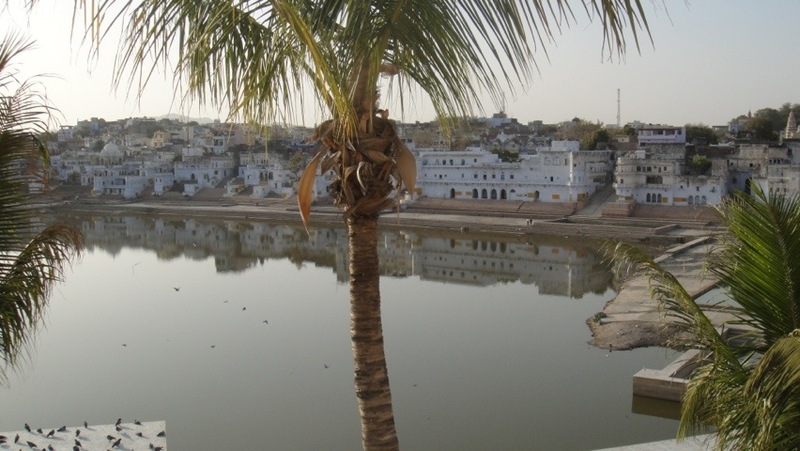 I’m watching life around the lake from the balcony of our suite in the Pushkar Palace Hotel. Yes, I know, another palace. I can tell you this visit to India is soooo different to the backpacking trip I took to India twenty years ago. The sun is slipping behind the barren mountain ranges that surround Pushkar. The terrain is reminiscent of the Kimberlies of north west Australia, with the addition of stark white temples on the highest peaks. Pushkar is made up of a motley collection of flat-roofed buildings that hug the shore as the land rises up from around the lake. This collection of white and pastel rest houses, restaurants, tourist shops, yoga centres and temples follows a maze of narrow streets similar to some middle eastern souk. There is no sound of the usual horns or out-of-tune engines, as Pushkar is vehicle-free. Only the sound of birds, chanting, bells and drums. The drums sound like a mixture of religious fervour and Rio’s Mardi Gras. As the sun almost disappears and its reflection in the lake fades from pink to night-time black, the drumming continues to gather in speed. It generates an odd feeling of being relaxed yet increasingly tense at the same time. P.S. It’s almost completely dark and the bats have started to appear. The first ones to show up in the sky were cute and almost like little hummingbirds. Now the really big “carry a small baby away” sized ones have appeared. Not so cute. 2 Responses to Religious Detox: Can I do it?